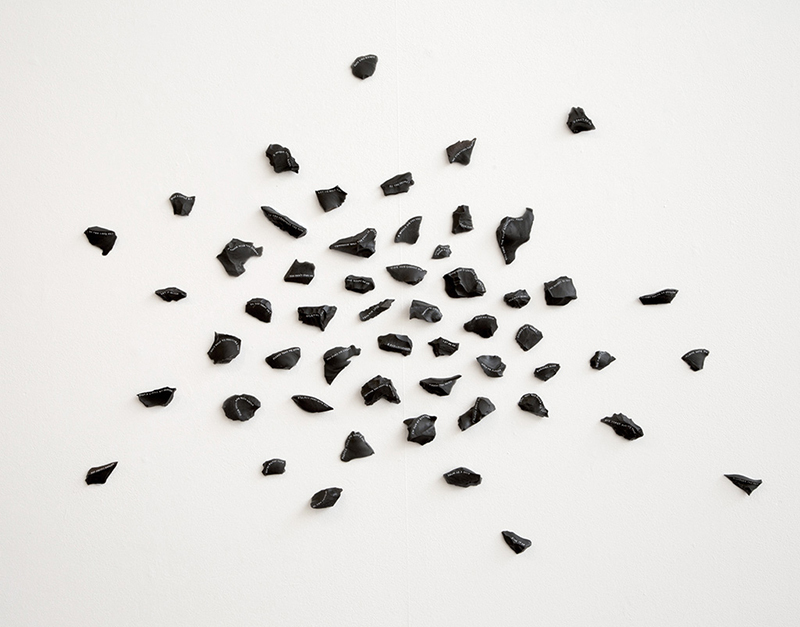 This installation was made with Katie Hayne and incorporates pieces of a volcanic rock (dacite) flaked by Tim Maloney and me. It was made in 2015 for the show Ground Truthings: Art & Archaeology. Many of us develop deep attachments to rocks; from ‘pet rocks’ and fossil collections, to precious minerals and stone artefacts. Over millennia people have used rocks to make stone tools, build structures and create commemorative markers. This work explores our deeply engrained cultural connection to the very fabric of our earth; through the inherent beauty in small geological fragments, and our desire to collect and arrange pebbles, through to the romantic sentiments and fetish qualities we assign to stoneobjects. Do you love me? Is this desire? The flakes we use here are predominantly debitage, or waste left over from knapping; a technique used to create stone tools, knives and spearheads. This particular material, dacite, is an igneous rock formed from volcanic eruptions and it was ordered online from America. Through a mixing of the deep past, recent past and the present, the historical context of these rocks is explicitly disturbed. 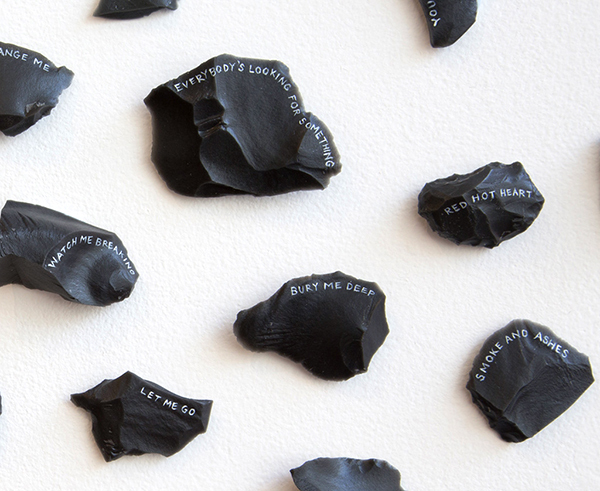 By writing on the dacite flakes we draw attention to the human hand and its role in the making and unmaking of histories, and urge a deeper consideration of how meaning, emotion, and knowledge becomes attached or ascribed to the things in our world.